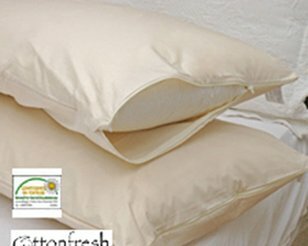 'Naturelle' allergen barrier covers in Cottonfresh luxury cotton fabric have been described as "the Rolls-Royce of allergen bedding." These supremely comfortable allergen-proof covers zip around pillows, mattresses and duvets to seal out dustmite, cat, pollen and other allergens. They're made of CottonFresh, a special 100% pure unbleached undyed cotton fabric, woven to a tightness that keeps out dustmites and allergens. CottonFresh barrier covers carry the Eco-Tex guarantee of textile purity so they're suitable for those who are chemically sensitive. In tests at the BTTG Laboratories in Manchester and the Medical Entomology Centre at the University of Cambridge house dustmites and their allergen could not penetrate the fabric. They can be washed frequently at temperatures as high as 90°C to sterilise them and remain allergen proof. Naturelle allergen barrier covers made of Cottonfresh are undetectable in use and you'll find them cool and comfortable.